Title: Who Will Run the Frog Hospital? So I read The Catcher in the Rye by Salinger, a cure for adolescence as per The Novel Cure. There was another book waiting for me to be devoured – for the same ailment and that was also recommended by them. 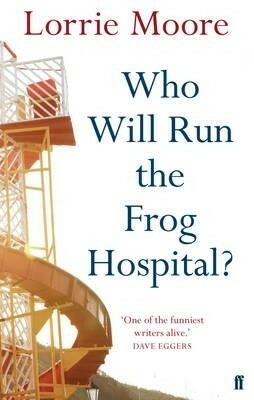 It is, “Who Will Run the Frog Hospital?” by Lorrie Moore. Let me tell you one thing here: If you think that Salinger had all answers to angst and adolescence, then you must read this small gem by Lorrie Moore, to really get into the skin of what it is to be young and the memory of it as it surfaces after a period of time. Who Will Run the Frog Hospital is a bittersweet tale about growing up. It is not written in the linear format and that is one of the things, which I loved about the book. It does not sentimentalize teenage or adulthood. Moore has this uncanny ability to show things for what they are. If the characters are hurt, then the reader must feel it. If they are happy, the readers must rejoice in their moments. I also firmly believe after reading this book, that every reader who wants to read a book on teenage must start with this one. The book is about two friends – living in small-town America, in a place called Horsehearts – somewhere on the border between Canada and the US. The friends are Berie and Sil and the story is narrated by Berie. The story moves between Paris, where Berie is with her husband and going through a tough time in her relationship, to the time she was fifteen and life changed drastically for her and her best-friend Sil. The book shifts narratives and that is what keeps the reader going. The themes of adolescence and the angst with it are touched on brilliantly. “Who Will Run the Frog Hospital?” is sensitive and yet restrained. Moore does a fascinating job of describing the ordinary with details and grace that are nowhere close to being ordinary. Growing-up and in contrast adulthood are dealt with delicately, without overstepping on any one aspect. The characters shine through the entire book. There is not a single line or situation which should not have been a part of the book. Thank God, I got to know of this book through The Novel Cure and read it as a part of the challenge. A read for everyone who wants to read more about adolescence and be cured. This entry was posted in Adolescence, Books, Faber and Faber, Literary Fiction, Review, The Novel Cure Reading Challenge and tagged adolescence, angst, faber and faber, literary fiction, Lorrie Moore, The Novel Cure, The Novel Cure Reading Challenge, Who Will Run the Frog Hospital? on October 20, 2013 by thehungryreader.